The Parish Council is rightly proud of its recreation ground. A lot of people say it’s the best in the area – clean and safe. 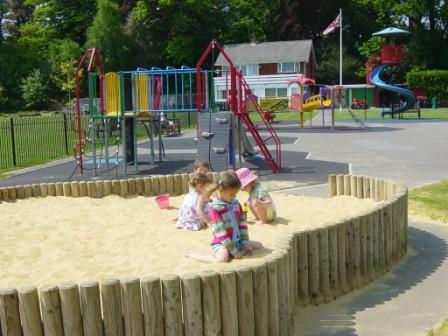 The open recreation ground is available for you to enjoy, to picnic or play games. You are asked to keep this area tidy for the enjoyment of others. For more information on the Recreation Ground contact Graeme Kennedy, Grounds Manager, on 01344 874268. 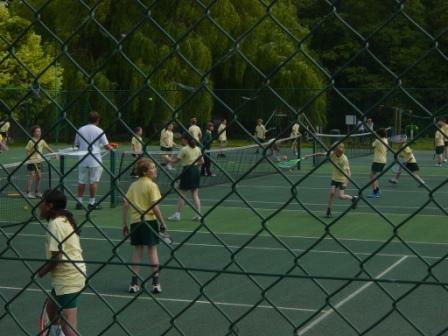 The Parish Council has entered into an agreement with Charters Tennis. The long term aim is to become a Beacon site that is recognised by the LTA. 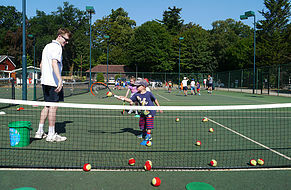 A tennis coach will be on hand with the overall aim of increasing community playing of tennis. Individual adult membership (over 18 years) costs £60, family membership (parents and up to two children in the family (aged 5 -18 years) £100 and Junior membership (5-18 years) £30. There are no additional costs for using the courts. Members can sign up on the programme and book online. You can still play without being a member – £5.45 per hour – although it is preferable that you book online. For full details visit the Broomhall Rec pages on the Charters’ Tennis website or call 01256 463673. 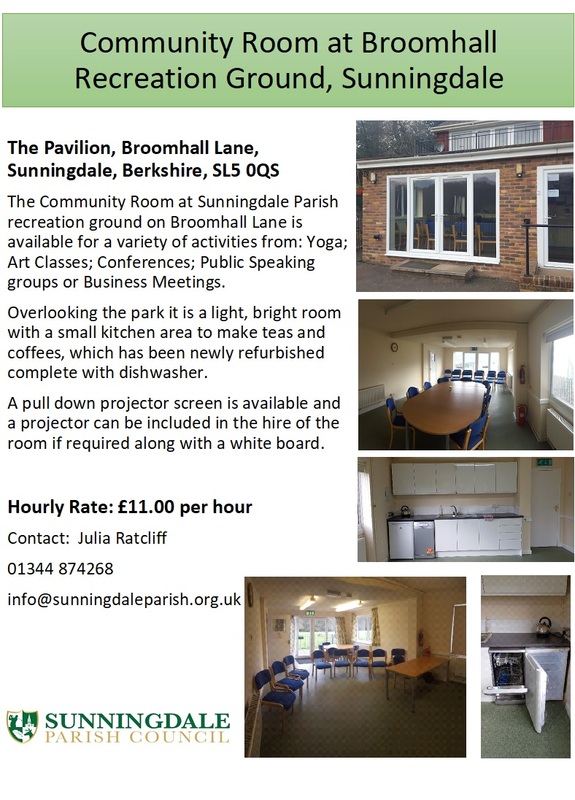 As part of the future work of Sustainable Sunningdale the Parish commissioned a garden for the community. The intention is to encourage people to grow their own vegetables and to demonstrate how this can be done, when to plant, how to cope with pests, and how to make the best of a small plot. The garden will be open to the public every day, and in addition there will be a chance to quiz Graeme (the Grounds Manager) weekly when he is tending the garden. Ask him if there are some beans or other produce ready for harvest – and taking home. Meanwhile, here are four hopefully useful sheets, highlighting seasonal jobs in the fruit & vegetable garden – winter… spring … summer … and autumn. The Parish Council decided to install a set of cricket nets in 2009. The popularity of the nets led to the recent acquisition of a set of cricket equipment that can be used in the nets. It consists of stumps, bat and ball. These items can be borrowed for a small deposit. The most recent additions to the Recreation Ground have been the cardio workout equipment. 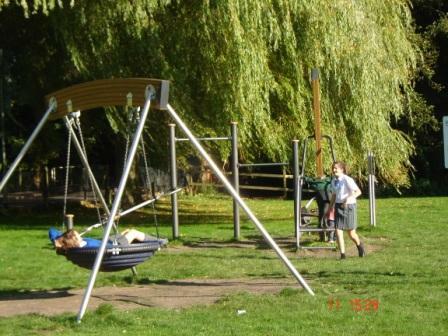 The Parish Council has installed eight pieces of equipment which are designed for use by all ages to encourage fitness. The leg press, skier and body twist can be enjoyed by two people at the same time, while the air walker, rider, cross rider, cycle and rowing machine are designed to individually build up muscles. Many favourable comments have been received on the equipment . . and they are clearly fun and well used all throughout the day. 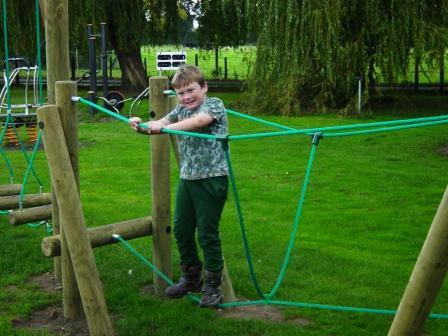 The Parish Council continues to expand the equipment at Broomhall Recreation Ground to the obvious pleasure of the older children. Next to the eight pieces of cardio equipment installed in May, we have now added a rope trail and a multi-sport goal which is suitable for a variety of sports. All this was paid for from S106 Developers Contributions. The playground now has a great range of challenging equipment, which has built our reputation as the place to play. The swings, slides, carousel and sand pit for young children formed the initial phase of the redevelopment of the Recreation Ground. It was eventually followed by the Teen Scene, an area with a climbing frame. Just like the young children’s area, this area proved to be very popular. The latest addition to the Teen Scene area has been a pod swing. The gazebo and the water feature (both pictured on the right) are the latest additions to the Recreation Ground. They were installed over the late winter and spring period of 2013.